Well, my back's still not 100%. But after a whole week of doing absolutely nothing I was getting a little stir crazy. So when a friend asked if I wanted to paddle the South Fork (class III) I jumped at the chance. Something nice and easy, a little float down the river with old friends and new. I think my back could handle that. And the other thing that became apparent over the weekend is how great the river community is. Since I haven't been paddling much, I really haven't been out on the river. I didn't even realize how many people I just wasn't connecting with. I managed to run into friends from all over - one up from L.A. for the weekend, a Brit living in the Bay I hadn't seen in months, a river local who never makes it down to the city. And most of the regular assortment of friends who live up there. So I don't have any exciting videos to share. Not even pictures thanks to the film that has developed on the lens of my waterproof camera. And I don't have any tales or insight into paddling from this trip. But I had a really good time, and that's what taking it easy is for. I know it's been a while. I haven't been paddling for reasons I won't go into. But I'm back now and hopefully will be getting on the water again (and updating this blog when I do). So it's been super hot here in Sacramento - over 100F for the past ten days. A trip down to the ocean sounded like the perfect day to cool off. Some of the locals had the same idea and where planning to paddling out the Golden Gate on Sunday. I decided to head down a day early and meet up with a Bay Area local for a paddle out of Dillon's Beach. When I arrived it was 55F and foggy, with a little breeze already flowing. Nice relief. Dillon sits at the mouth of Tomales Bay. 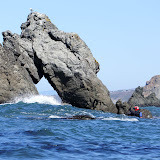 We launched and headed the other direction: towards Bodega Bay. We didn't plan on going far, but instead stayed close to shore to explore among the rocks. The swell was small and it allowed for a peaceful and interesting inspection of barnacles and seaweed. It's been several months since I've been on the ocean, so it was nice to just feel the swells and run a few slots. We passed the mouth of Estero San Antonio, heading up it about twenty feet before deciding it was just too shallow to keep going. Even our coast is dry and barely flowing at the end of this hot summer in California. we stopped at a beach just up from the estero that normally has a small waterfall but the trickle of water barely made the stone wet. Still, it was a nice spot and as we set we watched the fog come and go - it kept hinting that it would break up and leave us a blue sky but it never did. When we returned to Dillon Beach, not only was the sand more crowded with beachgoers, but we met a few kayakers just outside the surf zone. 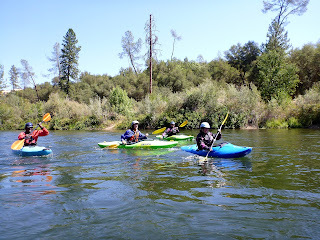 They were some folks practicing for the upcoming skills clinic from BASK - Bay Area Sea Kaykers - the local paddling club. We followed them in and after cleaning up hung around to talk paddling for a while. A very nice return to paddling.